The focus of my Monday Made It project is definitely the classroom now! First day of school is August 12th!!! 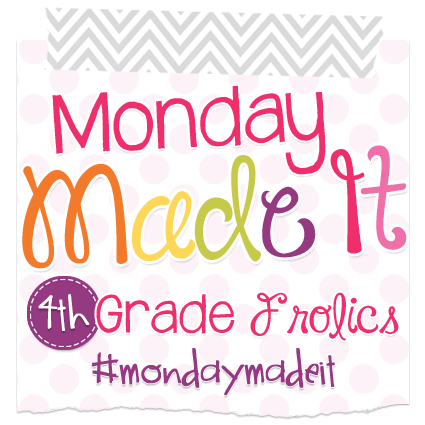 I'm linking up with 4th Grade Frolics again for Tara's MMI! Don't forget ... the TpT Back-to-School Sale begins today! My entire store is marked off 20% and be sure to enter code BTS14 at checkout for a total of 28% off! The sale only runs for 2 days, so pick up your deals quickly! 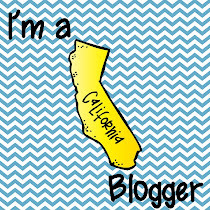 You can visit my store HERE! I am so excited to have completed this next project! I made a Coconut Tree Floor Mat!!! I have been eyeing this on one of my Pinterest boards for a few years now, and I finally decided to give it a try! 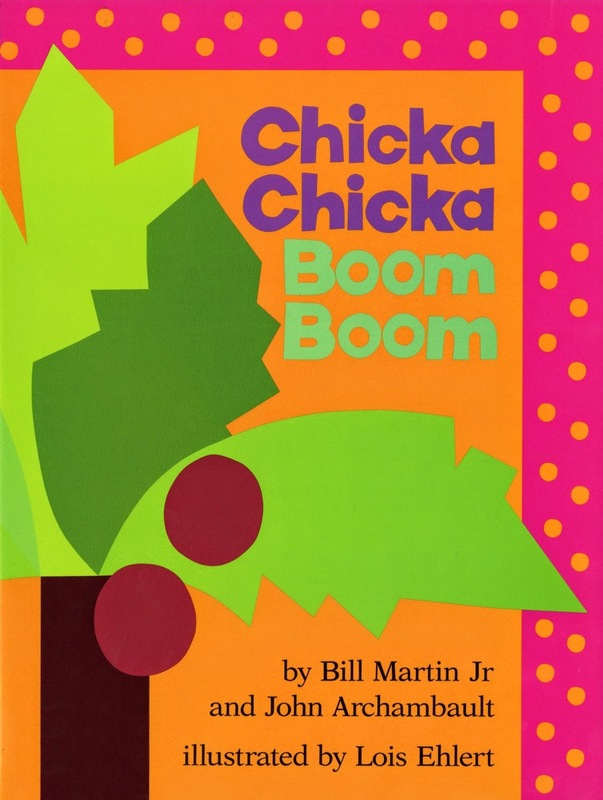 The idea comes from Making Learning Fun - a Chicka Chicka Boom Boom floor mat! 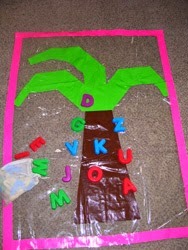 If I was in Kindergarten, I would love using this floor mat to act out the story of letters climbing up the tree and then falling down!!! I followed the directions from Making Learning Fun, except that I added an additional plastic piece on the top for protection. I think that my Kinders will mess too much with the tape if they can access it! However if you do not want to add the top piece that is okay. I purchased the supplies at my local Walmart. The clear plastic was in the sewing/fabrics section and the duct tape was in the paint supplies section. You will need a 1 or 2 plastic pieces that each measure 52 inches by 40 inches. The large roll was 52 inches wide, so I picked up 2 1/2 yards, to make front and back. You will only need 1 1/4 yards if you are doing just one piece of plastic. This plastic smells toxic when you first buy it. :( But the odor mellows out in time. You also need brown, green, and pink duct tape. 1. Cut 1 or 2 pieces of plastic, each 52 inches by 40 inches, depending on the version that you are making. One piece will be the bottom (you add tape to this one) and the other plastic piece will cover the taped piece. I left the paper backing on while I worked on this project. Be sure to tape right to the plastic. 2. On one piece of plastic, place a 13 inch piece of brown tape about 5 inches up from the bottom edge. Then place a 6 inch piece of brown tape about 25 inches above the bottom brown tape. 3. Place a 25 inch piece of brown tape on each side from the top to the bottom to form the trunk. 4. Then fill in the middle with rows of brown tape. 5. For the leaves, I created a template from blue copy paper. I slipped the template under the plastic. 6. Then I placed strips of green tape over the template to create the leaf on the left side. 7. Then I flipped the template to create the leaf on the right side, slid it under the plastic again, and added the green tape. Oh, and that's one of my helpers, Bootsie!!! 8. For the top leaf I made a longer template, and once again placed it under the plastic. Then I topped it with green tape. 9. Then I filled in the bottom of the leaves near the trunk with more green tape. 10. Take the other piece of plastic and place it on the top, matching the edges. I got rid of the paper backing at this point. Then using pink tape, tape the two pieces together by placing half of the tape on the back edge and then folding it over to the front to seal the edges together. After doing all four sides, I add a full strip of pink tape to the front to cover the other pink tape. 11. Place on the floor and add some large plastic letters. I picked these magnetic letters at Lakeshore. I have only 2 more blocks to finish, but I am waiting for the templates to arrive from Amazon. They are called Drunkard's Path!!! LOL!!! Very cute! I love the quilt square too! I miss sewing and have to get back to it! Thanks for stopping by! I enjoy sewing, but find little time to do it during the school year! Your coconut tree is awesome! I have a kitty helper who's always right where I'm working! I'm your newest follower, too! Sale at Teachers Pay Teachers!